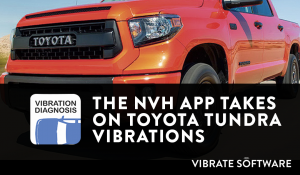 The NVH App Takes On Toyota Tundra Vibrations - Vibrate Software, Inc.
A few years ago a 2007 Toyota Tundra 4x4 was donated to the automotive program at the school where I teach. This vehicle had been used in a “Ride and Drive” event that had introduced the new bigger, heavier-duty Tundra. A Ride and Drive event is an event where anyone interested can drive a new vehicle on a closed course or track to check out the vehicle’s capabilities. During these Tundra events, Toyota dared people to try to abuse the truck to prove how tough it was. This truck had been severely abused over the course of several months of “Ride and Drive” events. The truck was then used by Toyota Technical Training centers for a few years and then donated to our automotive program. This truck has the 5.7L engine, 6-speed automatic transmission, and 4.30:1 axle gears! This is a burnout machine! When we received the Tundra, I noticed that all of the tires had feathered edges and were nearly worn out, especially the right rear tire. It was obvious to me that many “One Tire Fires” had been performed with this vehicle. For those of you who do not know what a One Tire Fire is, it is when a vehicle without a limited slip differential does a tire burnout. That means that all of the engine torque is transferred to the right rear tire rather than to both rear tires. 4x4 trucks typically do not come with limited slip differentials (although it is optional), many 2WD trucks do. This truck has a severe vibration and terrible noise coming from the rear axle. I used this truck in a manual drivetrain class because I wanted to teach vibration diagnosis with it as well as teach rear axle overhaul to diagnose the abnormal noise. The differential pinion pin lock bolt was broken off. We unscrewed it and it was just a stub. We were able to remove the broken remainder of the lock bolt by driving it our from a hole on the opposite side of the case. The differential pinion pin would rotate with the right hand side gear. We had to use a hydraulic press to press out the differential pinion pin. It turns out that the right-hand side gear had friction welded itself to the differential pinion pin. I had never seen that before and I was wondering how that could have happened. I realized that during a “one tire fire”, the right-hand side gear on an open differential will spin at twice its normal speed. As the differential side gear rotates, it spins on the differential pinion pin. There is very little lubrication provided to the side gears under normal conditions, so if someone performed a very long “one tire fire”, centripetal force would allow any remaining lubrication to be flung away from the gear and pin. Under these conditions, extreme friction would occur and the eventual welding of the side gear to the pinion pin. Once the gear was welded to the pin, the lock bolt would shear off. To summarize, the severe noise and vibration from the rear axle was caused by the side gear welded to the differential pinion pin and rotating as one assembly. This type of vibration would be tire speed related, especially while turning corners, even slight turns or curves in the road. The NVH app includes detailed differential and axle diagnostic information. There are close to 300 possible sources of a vibration on a typical vehicle today. The NVH app eliminates the guesswork in vibration diagnosis and guides you step-by-step through the entire diagnostic and repair procedure. Get the NVH app today by clicking on the link below.